We’d love your help. Let us know what’s wrong with this preview of Across the Barricades by Joan Lingard. To ask other readers questions about Across the Barricades, please sign up. discrimination in the play version? Favorite Children / YA books from the 70's, 80's and earlier. The Kevin and Sadie’s series is based around two teenagers living in Belfast, Northern Ireland, during a time where there is great tension between the protestants and catholics living in the area, aka ‘The Troubles’. Kevin and Sadie used to be enemies but now at 17 and 18 years old, they meet again and end up falling in love at a time when no-one wants them to be together. This is a book series I originally read as a child and I was really happy to see it up as an audiobook in my library’s e-services. It was fantastic getting back into the story and remembering the finer details of Kevin and Sadie’s ‘Romeo and Juliet’ story that I had forgotten. This was narrated by Gerard Murphy who did a great job and I loved that he was also Northern Irish so everyone’s accents were correct, and I also find that accent to be extremely soothing and nice to listen to so bonus points. This is marketed as a series for children aged 10+ which I do find a bit odd as Kevin and Sadie are teenagers and the series does go on to explore their eventual marriage and family life but as a kid this didn’t bother me at all so I guess it was all okay then and all okay now. This is a book that looks finely at the tensions during The Troubles - a time when a Catholic boy couldn’t walk out with a Protestant girl without getting beat up. Kevin and Sadie have to live with violence every single day and the reader is with them as their tolerance grows less and less with the way they’re forced to live and hide their relationship. Kevin has to work hard to not be forced into doing violent things he doesn’t want to do and not become involved with old schoolfriends being involved with the IRA, or IRA activities. Sadie’s father is in the Orange Order, and her own brother has to constantly explain to others why he himself doesn’t want to join up as he is also sick of violence. I was sad near the end of the book as I had forgotten one of the things that did happen and it is quite heartbreaking. But I’m definitely going to reread the rest of the series as I had forgotten how much I loved it. For anyone who wants to know what children of the 1980s read during their schoolyears, and loved, this book would be high on that list. The others? Virtually anything by Roald Dahl. Most were published by Puffin. Someday, I hope someone calculates the impact their range had on Britain's youth. I doubt they will rate it as highly as it deserv For anyone who wants to know what children of the 1980s read during their schoolyears, and loved, this book would be high on that list. The others? Every bit as good as I remembered. I love the troubled Belfast setting, the star crossed lovers and how real it all feels. Even after all these decades. 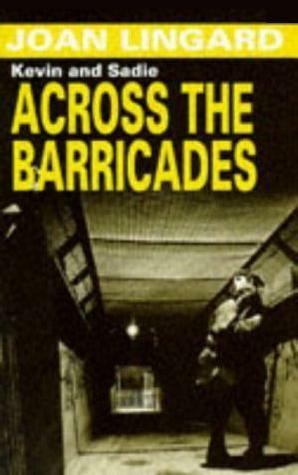 The second in a series of books by Joan Lingard, set during The Troubles in Northern Ireland during the 1980’s. I’ve read both the play and the novel (rating the novel). 1) this reads like the first in the series and I’d highly recommend starting here. Book one, sets the political scene and introduces the characters. 2) it is very much a modern Romeo and Juliet. Bar a few less deaths. Tragedy still prevails. 3) honestly and beautifully written, realistic and relevant today. 4) the protagonists, Ke The second in a series of books by Joan Lingard, set during The Troubles in Northern Ireland during the 1980’s. I’ve read both the play and the novel (rating the novel). 4) the protagonists, Kevin (Catholic) and Sadie (Protestant) are written aptly for their ages. An easy and enjoyable read that allows you to transport yourself into northern ireland in the early 70's . The content will never age, religious/ racial intolerance, political unrest, freedom to make your own choices and romeo & juliet romance. I gave this book to my teen and she loves it as much as I did at her age. Sadi , Kevin and their families ignited my interest in Irish history, religion and language. Една странна - и прекрасна - среща с книга, за която още не знам как да пиша. Нито как да я определя. Споменавала съм как започна и през колко етапа премина моето "запознанство" с Ирландия. От буйните песни на "The Pogues", през по-кротките /донякъде/ drinking song.. до случайно откритите преди около година мелодични и въздействащи песни с чисто историческо и /или/ дори политическо съдържание. Песни, които ме накараха да започна да чета история на Ирландия. И когато вече знаех навярно повече, отколкото исках да знам, за събитията, първоначално предизвикали интереса ми, някой ми напомни за един призрак от миналото. А именно - за тази книга. Защо казвам "призрак от миналото"? Защото тази книга е издадена в България преди 33 години, през 1988 - между другото, една много трагична за Северна Ирландия година. При това е издадена в поредица, която не ми беше непозната. "Библиотека Връстници" - наистина в нея излизаха най-вече книги от тогавашните соц-страни, в които не липсваше "идеологическа жилка", но въпреки това бяха добри истории, които помнех години след това. Но наистина най-вече книги от социалистически страни. И... сред тях... тази книга. Помня заглавието, но нямам спомен дали съм я чела навремето. Вероятно не - със сигурност щях да запомня, ако бях. Но когато ми попадна сега, нямаше как да не се запитам как тази книга е успяла да се "промъкне" сред всички тези социалистически романи. Е, предстоеше ми да разбера. И се заех с четенето. Нека кажа, че открих отговора. Ще се върна на това по-късно, но сега нека поговоря за самата книга и въздействието й върху мен. А от другата страна са барикадите. От другата страна е религиозният конфликт между католици и протестанти. Разделението в училищата. Стените, разделящи квартала на католиците от този на протестантите. Палежите, враждите и кръвопролитията, за които на човек му е трудно да повярва, че стават в християнска страна, някакви си трийсетина години преди края на 20 в.
И насред всичко това, насред целия този ужас - една любов. Едва зараждаща се, още несигурна, още "трънлива". И безкрайно "погрешна" и "забранена".
" - Мисля, че железарската работа е точно за теб... да се мотаеш по улиците за вехтории. - Днес улиците не са каквито бяха преди. Пък и ние не търсим такива боклуци, каквито има наоколо. Боклуците по улиците: изгорели коли, автобуси, бронетранспортьори, изкъртени павета, рола бодлива тел за барикади. А по улиците патрулираха войници с пръст върху спусъка на автоматите, мъже и жени ги следяха подозрително с поглед, деца си играеха на война, ала понякога съвсем не си играеха." This book was something my class and I read together in high school, I really enjoyed this book, although I don’t remember the ending. Whilst I liked the idea of this, the writing itself felt a bit simplistic and I found it hard to identify with the characters. It was very quick and easy though, and definitely very informative for learning about the troubles. If you want eloquent prose, it's not for you, but if you want a sharp novel about a relavant issue then I'd reccomend it. C'était le deuxième d'une série de cinq, je me demande si je lirai les trois suivants. En aucun cas, je ne lirai le premier. This review has been hidden because it contains spoilers. To view it, click here. O love all her books. . .they seem so alive!!!! A sweet, lovely and fast - paced book which shows us there are no boundaries regarding true love. Loved it - again. Remember reading it at school and it is still a great book. Man oh man. I can't imagine living in that kind of environment, and yet it still exists in many places today. An excellent book. I love Kevin and Sadie. We got to read this in our English class and I really enjoyed it. Didn't know it was a series until I finished it, so I might read the rest of the series. It is a book depicting everyday life in Northern Ireland back in the days when Protestants and Catholics were regularly fighting each other. It is about the everyday life of folk, who just want to life in peace and have everyone mind their The story of Sadie and Kevin was a very sweet and honest one. The troubles they, their families, their streets, and subsequently their city (Belfast) was facing were depicted very believable, honest, and without drawing conclusions or putting blame on anybody. I really liked this book, it was really nice to read. It wasnt full on and was just abiout right for my reading skills. It told me alot about Ireland and how people had to sneek out to see there friends that were different religions. The pepole must had found it vrey hard to understand what to do and how to cope with all the killing and fighting. Many people lost there lives when they were fighting for there Faith. I liked this book alot as it was very romantic and emotional as people that came v I really liked this book, it was really nice to read. It wasnt full on and was just abiout right for my reading skills. It told me alot about Ireland and how people had to sneek out to see there friends that were different religions. A bit like a modern day Romeo and Juliet, set in Belfast during the 1980’s when violence was prominent, aimed very much towards a teenage audience, with short sentences and no overly difficult language. It has some very twee moments, but also some very sad ones such as the deaths of people who try to ignore the religions and help whoever they felt needed to be helped. It highlighted well the religious and social cultures of different groups (many of which are inherited), as well as the similarit A bit like a modern day Romeo and Juliet, set in Belfast during the 1980’s when violence was prominent, aimed very much towards a teenage audience, with short sentences and no overly difficult language. It has some very twee moments, but also some very sad ones such as the deaths of people who try to ignore the religions and help whoever they felt needed to be helped. It highlighted well the religious and social cultures of different groups (many of which are inherited), as well as the similarities and differences between the different factions of people. A lot was alluded to in the book, but not specifically mentioned and I feel the first book in the series needs to be read in order to understand various situations and comments, along with the subsequent books in the series. Well at the start i thought the book was REALLY boring but then i seemed to get into it quite alot because it became more exciting soo i enjoyed it more. i think that in the middle of this book it was very tragic because neither of their familys really aproved of them bein more than friends because of their religious sides. But they thought that if another family in there vuillage could do it so caould they so this made me want to read more and more because i wanted to see what happened next! I was Well at the start i thought the book was REALLY boring but then i seemed to get into it quite alot because it became more exciting soo i enjoyed it more. Across the barricades is a good example of a novel that you can learn from with love,emotion,compotition,action and some brain teasers.the book starts as a simple story with two main characters kevin and sadie who are unfortunatly on different sides of culture where there is a seperation between catholics and prodistants and kevin and sadie cannot fall in love because of this seperation but there is more that meets the eye in this small quiet town. I would recommend this book to people who like t Across the barricades is a good example of a novel that you can learn from with love,emotion,compotition,action and some brain teasers.the book starts as a simple story with two main characters kevin and sadie who are unfortunatly on different sides of culture where there is a seperation between catholics and prodistants and kevin and sadie cannot fall in love because of this seperation but there is more that meets the eye in this small quiet town. Joan Lingard was born in Edinburgh, in the Old Town, but grew up in Belfast where she lived until she was 18. She attended Strandtown Primary and then got a scholarship into Bloomfied Collegiate. She has three daughters and five grandchildren, and now lives in Edinburgh with her Canadian husband. Lingard has written novels for both adults and children. She is probably most famous for the teenage-ai Joan Lingard was born in Edinburgh, in the Old Town, but grew up in Belfast where she lived until she was 18. She attended Strandtown Primary and then got a scholarship into Bloomfied Collegiate. She has three daughters and five grandchildren, and now lives in Edinburgh with her Canadian husband. Lingard has written novels for both adults and children. She is probably most famous for the teenage-aimed Kevin and Sadie series, which have sold over one million copies and have been reprinted many times since. Her first novel Liam's Daughter was an adult-orientated novel published in 1963. Her first children's novel was The Twelfth Day of July (the first of the five Kevin and Sadie books) in 1970. Lingard received the prestigious West German award the "Buxtehuder Bulle" in 1986 for Across the Barricades. Tug of War has also received great success: shortlisted for the Carnegie Medal 1989, The Federation of Children's Book Group Award 1989, runner up in the Lancashire Children's Book Club of the year 1990 and shortlisted for the Sheffield Book Award. In 1998, her book Tom and the Tree House won the Scottish Arts Council Children's Book Award. Her most recent novel, What to Do About Holly was released in August 2009. Lingard was awarded an MBE in 1998 for services to children's literature.